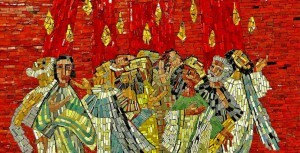 Pentecost – Acts 2 – "The Day of Pentecost"
It may surprise you to learn that the Day of Pentecost has been on the Church’s calendar a lot longer than Easter or Christmas. The Festival of Pentecost was established in the Old Testament, when Israel was in the desert making its way to the Promised Land. God told Moses to tell that people that the Promised Land would “flow with milk and honey.” Every day would be an ‘all you can eat and drink’ buffet. And not one of those $7.99 ‘all you can eat’ buffets. It’d be “the choices meat and the finest wines” all the time. And it would all be FOR FREE. That’s really news to people who happen to be living in a desert and who have been living on a steady diet of manna and quail, manna and quail, manna and quail and getting their drinking water from a rock. The Day of Pentecost is the annual day to celebrate and give thanks for the harvest. Initially, it was called the “Feast of Weeks.” From the day that the first grain was cut, they were to count a ‘week of weeks,’ seven weeks – 49 days. That’s the time it would take to bring in the harvest. The day after the ‘week of weeks,’ ON THE 50th DAY from when the harvest began, they were to bring baskets of grain to the temple as a ‘thank offering’ to God for the bountiful harvest. “Pentecost” literally means “50th.” It’s the “50th day” after the “FIRST FRUITS” of the harvest was cut. So when we read in second chapter of Acts, “When the Day of Pentecost arrived,” we understand that lots of ‘good and faithful Jews from all over the world had come to Jerusalem to celebrate the harvest and give thanks to God – as ‘good and faithful Jews’ had done for centuries. But as with all OLD TESTAMENT FESTIVALS, the OLD Day of Pentecost pointed to a NEW Day of Pentecost. On this day there would be another kind of harvest to celebrate. Not a harvest of grain – but a harvest of human souls. 50 days before the Day of Pentecost was Easter Sunday – the day that Jesus Christ rose from the dead – “the first-fruits of those who have fallen asleep.” The holy seed that was sown in womb of the virgin Mary has produced His crop of Christians, and what a crop it is. The harvest began with the Apostles on Easter Day. Jesus walked right through the locked door of the Upper Room and said, “’Peace be with you.’ And when He had said this, He breathed on them, and said to them, ‘Receive the Holy Spirit.’” (John 20:21f). That was His LITTLE PENTECOST. While He was still with them, He had promised, “When the Spirit of truth comes.. whatever He hears He will SPEAK… He will take what is mine and DECLARE it to you.” (John 16:13-14). Now, filled with the HOLY SPEECH breathed into them, they begin to SPEAK – just as the prophet Joel had promised, “in those days I will pour out my spirit, and they shall PROPHESY.” (Acts 2:18). This looks more like the kind of harvest that we’re familiar with. Bone dry, thirsty, parched lives. The kind of dried out life the psalmist was talking about when he said, “my tongue sticks to the roof of my mouth.” A mouth full of sand and not enough saliva to spit it out. Dry mouth – can’t speak. Dry eyes – can’t see. Dry bones – can’t stand upright. “My strength is dried up like a piece of broken pottery.” (Ps.22:15). Exhausted, weary, worn out. That’s where it all begins you know – “Hear the word of the Lord.” For “faith comes by hearing and hearing by the Word of the Lord” – and not apart from it. (Rom.10:17) “O dry bones, hear the word of the Lord…” For no matter how ‘dried up’ you think you are, no matter how ‘hopeless’ you think your situation is, no matter how deeply you have cut yourself off from the Word of Truth – your Lord has not cut Himself off from you. Nor has He given up on you. His Word can even be heard EVEN by those who are dead. And He can breathe new life into dry-boned skeletons. And as the Spirit of the Lord breathed Himself out onto this ‘valley of dry bones’ through the preaching of His prophet, “behold, there was a sound and behold a rattling, and the bones came together bone to its bone. And I looked, and behold, there was sinews on them, and flesh had come upon them, and skin had covered them…. Come, from the four winds, O breath, and breathe on these slain, that they may live…. And the breath came into them, and they lived and stood on their feet, an exceedingly great army.” WHAT A HARVEST! The Holy Spirit is poured out on the Apostles and Peter PROPHESIED, and 3,000 dead in their sins came to life. 3000 baptized into the name of the Father and of the Son and of the Holy Spirit – forgiven all of their sins – raised from the dead. 3000 returning to their homes, rejuvenated, hopeful, alive, each SPEAKING in their own native language, telling their children and neighbors and co-workers and whoever will listen the Good News. It was like a field of ripe dandelions. When the wind blew on them, all the seeds blew off and landed and took root and spouted and grew into a whole new crop of breathing, walking, LIVING children of God. What a harvest. All of this, just as Jesus promised. “When the Helper comes, whom I will send to you from the Father, the Spirit of truth, who proceeds from the Father, he will bear witness about me.” (Jn. 15:26). By His cross and for His sake, the Holy Spirit TODAY SPEAKS to us saying, ‘Hear the Word of the Lord,” your hope is not lost. You are not indeed cut off. Christ Jesus Himself has been ‘breathed into you.’ In Him, you are very much alive. A blessed Day of Pentecost to you all.